I recently bought a bicycle! Although it’s tough to find great spots to ride in Hong Kong and I have had a park security guard give me a good chase, I’ve found a way to use it a few times a week. I’m now riding it to my yoga classes and since it’s a fold up bike, they’re letting me park it inside. It’s honestly pretty cool rolling up in a bike. But it shouldn’t be. Cycling should prominent in every city. Especially in cities that are concerned about air quality like Hong Kong! 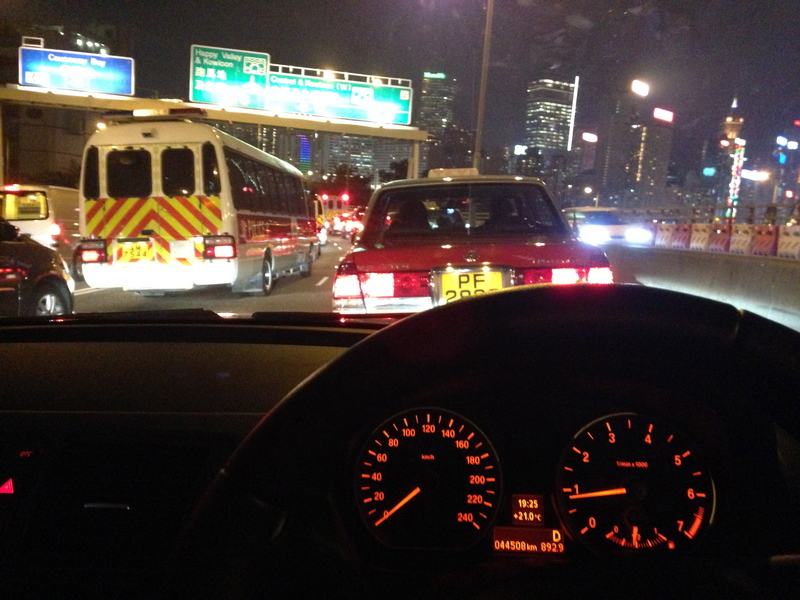 Here I am stuck in traffic…again. When I look at all the land reclamation going on around Hong Kong Island, with such flat land along the harbour, and that it’s only 8km from Tai Koo to Central, it baffles me why the Hong Kong government doesn’t have bike lanes along Victoria Harbour. Is this just another case of the shortsightedness by the HK Government? Anyways, I’m happy with my bike, feeling like I’m a kid again. 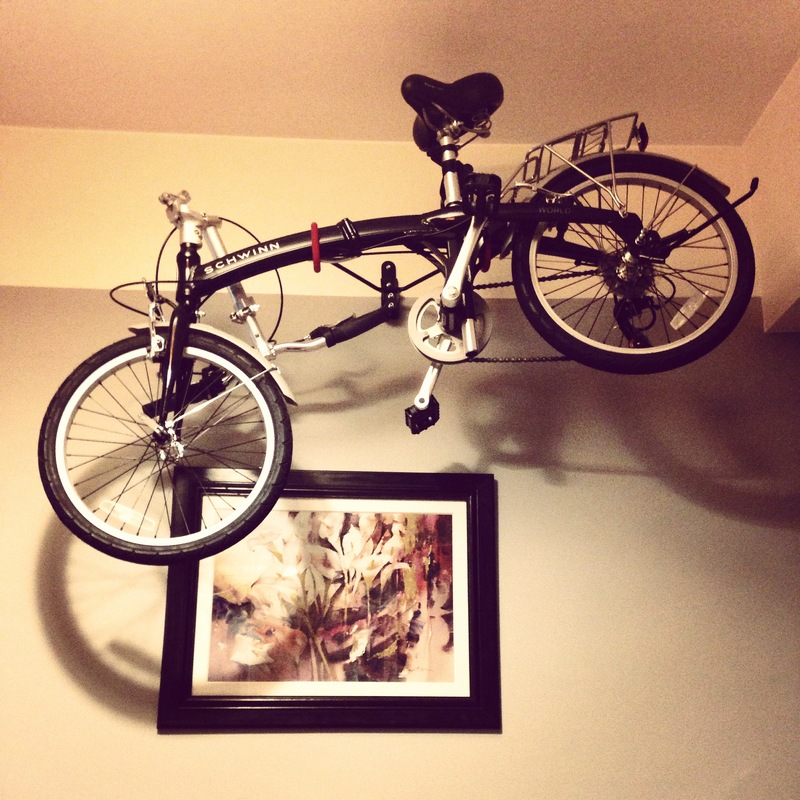 We’ve even found creative ways to store our bikes in our small apartment. Do you have a bike? Want a race?! Never have there been truer words about how cities should be tackling pollution. It is crazy that cities continue to support the car and continue to ignore the benefits of installing cycle routes: better air, better health and better living. But, cyclists are far harder to get tax money from! Here in another high densely populated Asian city, Busan, the local government has made huge improvements in the matters concerning cycling and healthier living. Ten years ago, Busan was a city solely focused on the car. Today, the city has cycle paths that are safe, scenic and extensive. That is not to say they are perfect. But, having lived and cycled previously in London and the UK, I can say that Busan and Korea is fast becoming a cycle heaven. Thus, I hope Hong Kong heeds your words and starts installing cycle paths and promoting the benefits of cycling. Good luck to you. This entry was posted on December 10, 2014 by theguestroom in myHK and tagged Asia, Best, bike, biking, Blog, charity, cycling, HK, impactHK, Mr.J, myHK, number 1, number one, the guest room.